Don’t Beat the Heat, Reuse It! Growing global awareness of the importance of eco-friendliness has boosted the drive toward finding cleaner and more sustainable energy sources. This has brought the spotlight on solar, hydroelectric, wind and biomass power. What isn’t as well known, however, is how much energy is produced and unfortunately wasted in industrial processes like the production of cement and data or the handling and processing of sewage. One alternative source of energy promises clean and sustainable energy while simultaneously reducing waste and pollution: waste heat. The global market for waste heat recovery for energy use is expected to skyrocket to USD 30 billion by 2024, per Global Market Insights . A variety of factors are fueling the sector’s growth, from Europe’s ever-stringent CO2 regulations to the crucial need of Asia’s rapidly industrializing economies like China and India to tame pervasive pollution and meet growing power demand. Europe is leading the global drive to harness waste heat as power; for example, Denmark gets around 50 percent of its electrical power from recycled heat. In contrast, the U.S. gets just 12 percent of its electricity from the same source but wants to raise that figure, so the potential of this niche market holds huge upside. The implications of reusing waste heat as energy are enormous. Sensing a promising opportunity when they see one, HVAC manufacturers are now pursuing this rising trend with a bit more vigor. Further boosting interest in this field is the staggering potential for the volume of energy recovered through waste heat, including sewage, seawater and industrial waste heat. LG Electronics is doing its part to advance the burgeoning drive toward waste fuel recovery through its ecofriendly and high efficiency Centrifugal Heat Pump. As a highly efficient device, heat pumps work by driving a thermodynamic cycle with a small amount of energy; this converts low temperature heat into high temperature heat energy capable of producing hot water of up to 80℃. The heat pump cycle works essentially the same as a refrigeration cycle. When the user utilizes heat removal at low temperature, this is referred to as refrigeration (i.e. refrigerators and air conditioners). When the user utilizes heat emitted from high temperatures, however, this is referred to as a heat pump. Heat pumps generally supply 100 percent of heat by using 70 to 80 percent of the unused heat source and 20 to 30 percent of electrical energy. They offer remarkably high efficiency and considerable value in energy conservation and CO2 emissions reduction. The LG Centrifugal Heat Pump is distinctly known for its globally competitive 2-stage refrigerant compression that lowers energy use and allows for customized designs depending on heat source and hot water conditions. In addition, the R-134a refrigerant used in the Centrifugal Heat Pump is one of the more ecofriendly models on the market. The result is astounding reductions in CO2 emissions and operating costs. This puts to rest the notion that technology that reduces pollution, promotes sustainability and saves the environment isn’t business-friendly. Incorporating its advanced technology, LG has developed heat pump solutions that utilize waste heat. 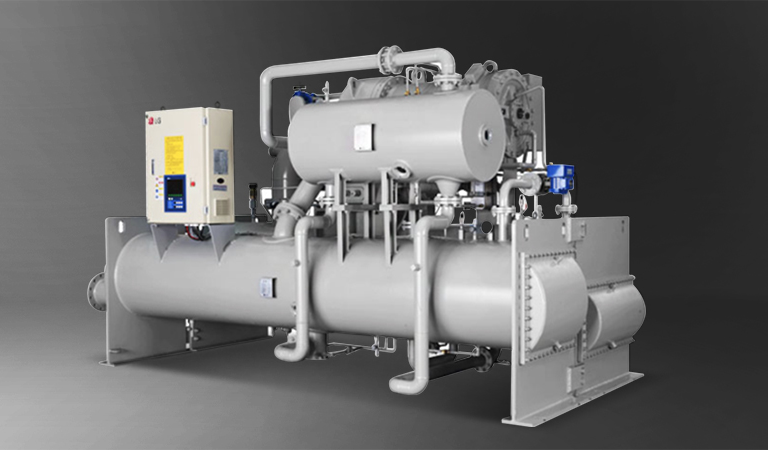 One of the company’s achievements in this regard is a secured contract to install a heat pump at the district heating supply facility for Seoul’s Magok district (a new business-residential area). The facility, which was completed in November 2017, will utilize the sewage water discharged from the city’s Southwest Water Reclamation Center to the Han River to supply district heating heat to 24,000 households a year. This will have the ecofriendly effect of planting an estimated 110,000 pine trees a year. These efforts have earned LG national acclaim for its innovative achievements, yet the company’s biggest reward is seeing less pollution and higher energy efficiency through advances in eco-friendly fields such as waste heat recovery. Climate change and environmental preservation are two key tasks facing the globe. Both business and governments are pursuing technologies and processes that boost efficiency and eco-friendliness, and waste heat recovery is part of this ambitious and essential campaign to ensure the environment remains intact for future generations. LG has continually strived to produce and supply ecofriendly and highly efficient air conditioning products to industrial facilities. Not to rest on its laurels, LG seeks to keep advancing knowhow in and spread of waste heat recovery. In this case, haste definitely makes less waste.